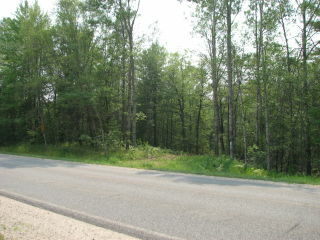 This 31.7 acre parcel fronts on Old State Road, just 1/2 mile North of the entrance/exit to Hwy U.S. 10. Paved County Road, Plowed year 'round. 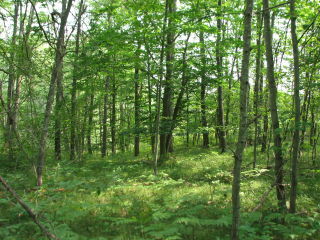 Wooded throughout -- mostly hardwood, a pleasure to walk through. 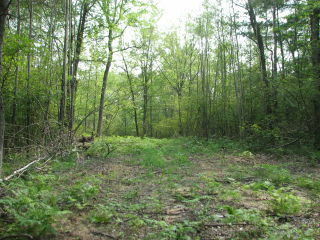 This "L"-shaped parcel measures 358.66 ft on Old State Road. It runs 1,952.59 feet back from the road, and then turns South and runs another 1,675.16 feet. The best way to visualize this is look at the plat. It will make an ideal building site, and is also suitable for a mobile home, and for camping. 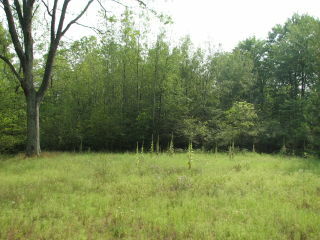 This is a beautiful parcel of land, with county road access. All the corners are surveyed. I've brightened up the stakes on the road with bright orange paint to make them easy to find. At the top of this detail page you'll see GPS coordinates. If you have a GPS device or a smartphone, you can enter those coordinates, and your device will lead you straight to this parcel. Otherwise, look on the sidebar at the "Map to the Land" link, and you'll get an interactive map with a flag right on the property. This will be easy to find-- no more wondering if you're on the right property. All my life, Clare County has been known as the Gateway to the North. I've had some great times in this area. Land is hilly and beautiful. 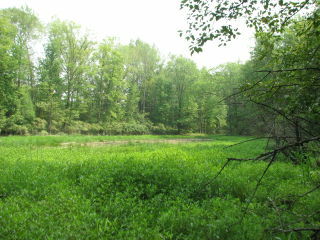 The hunting is great, and there are lakes and streams everywhere. 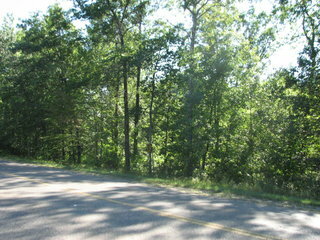 This parcel is located on Old State Road, a paved county road maintained by the County and kept plowed and open year 'round. Electricity runs all down Old State Road. This is a no-brainer. For water and sewage-- hey, you're out in the countryside. If you want these, you'll have to put in your own well and septic. This land is mostly high and dry with sandy/loamy soil. You'll have no problem with drainage, and can put a septic tank and drain field anywhere you like. This parcel is full of all kinds of wildlife. There are several a few marshes here and there, you can spot them if you look at the aerial photo I've provided with the Plat link. 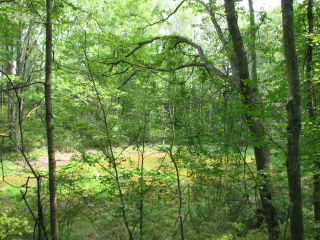 Look at a larger map and you'll see there are also numerous lakes nearby. So the wildlife has plenty of water. If you like to hunt, you can't beat this location. You're right by the highway, within a few miles of where several major highways come together. You can jump in the car and be here quickly, from almost anywhere in Michigan. Clare county is the home of Jay's Sporting Goods, one of the premier hunting/fishing supply stores in northern Michigan. You'll be just ten minutes down the road. Camping. 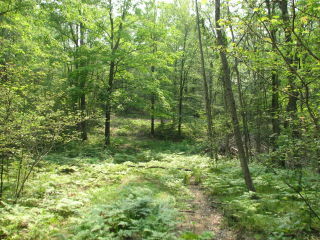 There are lots of campgrounds nearby, which tells you this is a popular recreation area. They stay pretty full, and you have to make reservations months in advance, unless of course you own your own land. Restaurants / Bars. 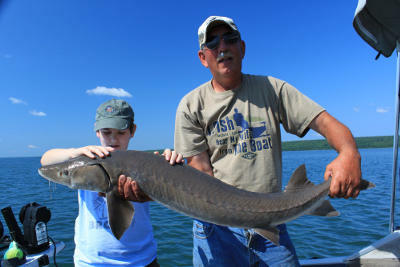 Clare county is all about recreation. With Farwell less than five minutes away, and Clare less than ten, you'll find no shortage of dining and nightlife. Recreation. Clare County is home to more than 50,000 acres of State Forests, 300 miles of rivers, 28 miles of snowmobile trails, and at least 18 lakes with public access. If you look back at all the boring days you've had in your life, I promise you none of them were spent here! If you want to learn more about recreation in Clare County, have a look at this guide. Clare County, Michigan; T17N-R05W Part of the E/2 of Section 11, and part of the NW 1/4 of Section 12, Beg at the 1/4 Corner common to said Sections 11 and 12; thence S89°22'04"W, along E/W 1/4 line Sec. 11, 331.43 feet; thence S01°31'00"W, parallel with the E line Sec. 11, 1314.61 feet to the S 1/8 line of Sec. 11; thence S89°50'00"W, along said S 1/8 line, 502.66 feet; thence N01°28'51"E, 1,675.16 feet; thence N89°13'44"E, 824.98 feet to the Sec line common to Sec. 11 & 12; thence S89°13'56"E, 1,127.61 feet to the W'ly r/o/w of Old State Road; thence S13°15'47"W, along said r/o/w, 358.67 feet to the E/W 1/4 line of Sec. 12; thence S89°53'41"W, 1,209.13 feet to the p.o.b. Together with and subject to a 33.00 foot wide easement for ingress and egress and the installation and maintenance of public and private utilities lying in part of the NW/4 Sec. 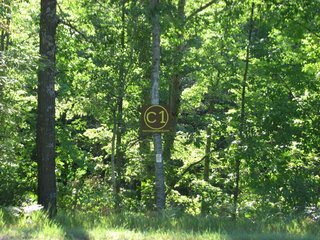 12, with a centerline described as: Comm at the W 1/4 Cor Sec. 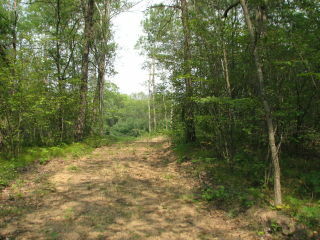 12, thence N89°53'41"E, along the E/W 1/4 line of Sec. 12, 1,209.13 feet to the W'ly r/o/w of Old State Road; thence N13°15'47"W, along said r/o/w, 609.40 feet to the p.o.b. 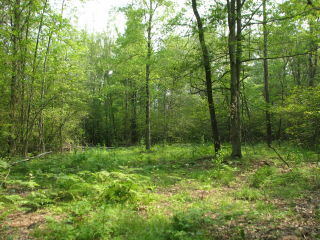 ; thence S47°18'39"W, 174.33 feet; thence S30°16'01"W, 141.72 feet to the N line of the above-described parcel. Cash: $500 today, balance within 30 days. Seller will deliver a warranty deed within 10 days of receipt of full payment. 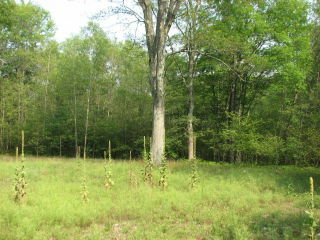 Land Contract (Standard): $10,790.00 down, $1,211.51 per month, for 15 years. Payment includes property taxes. Interest rate is 11% simple interest; no penalty for early payoff. 90 days same as cash. That means you can buy on land contract, and if you pay off the full balance within 90 days, you pay zero interest. Land Contract (Low Down Payment): $5,395.00 down, $1,688.32 per month for the first year, after which time your monthly payment drops to $1,211.51. Payments include property taxes. Interest rate is 11% simple interest; no penalty for early payoff. Term is 15 years; 90 days same as cash. Checks are accepted. For cash deals, checks must clear before deeds are issued. Bitcoin (contact us for our Bitcoin transaction number.